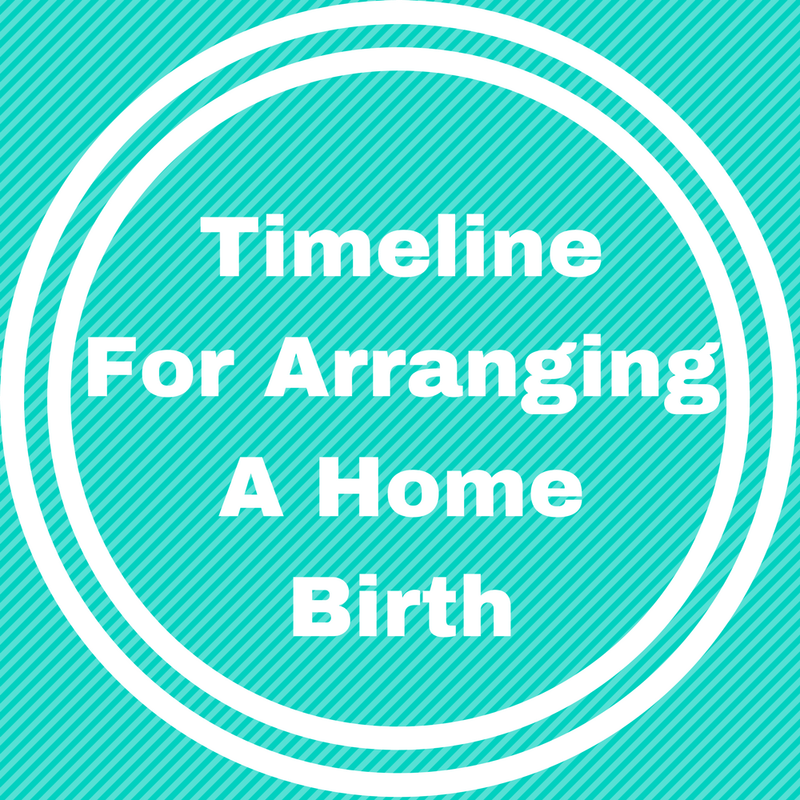 When I first started planning for a home birth, I didn't know anybody who had had one; I wasn't sure what was involved in arranging one or what would happen and when. If you know you want a home birth, you can tell your midwife at any point from your booking appointment onwards. The sooner, the better, really. I swithered a bit about whether or not I was brave enough, so the first time I mentioned it was at my 28 week appointment. I felt really quite self-conscious bringing the subject up - home births are still very much the exception in Scotland, and I was a little nervous about what my midwife's reaction would be. Are home births seen as this year's pregnancy trend? Would I come across as high maintenance or self indulgent or completely detached from reality? But, as friends kept pointing out to me, it's my body and my labour experience and my choice - nobody had to like my decision but me (and, ideally, Steve). As it turned out - and not surprisingly, given that she's lovely and has been unfailingly supportive of all my other choices - my midwife was great. First, she talked to me about the benefits of home birth, which include a reduced likelihood of intervention, increased comfort and relaxation due to being in familiar surroundings, focused attention from two midwives, reduced need for childcare and less likelihood of being separated from your partner straight after the birth. Then, she talked to me about the risks and drawbacks. These include the on call midwives being unavailable to support me as they're attending somebody else's home birth, the possibility of complications which would result in a transfer to hospital, the possibility of needing to go to hospital for stitches if I had a tear beyond the midwives' ability to repair (eek! ), and the very minimal supply of gas and air (less than three hours, total). She confirmed that there was nothing in my records which would cause her to advise against a home birth. She also confirmed that there was no reason the midwives couldn't go on call for me from my preferred date of thirty-seven weeks. She reminded me that, if the baby went overdue, I would be offered an induction between seven and twelve days past my due date, but she stressed that it would be entirely up to me whether or not I accepted. Suddenly, it all felt very real! My midwife came round, firstly, to check our home is suitable for home birth and, secondly, to do my routine antenatal checks. In addition to the usual antenatal checks, I had to have an extra blood test for anaemia which can be a concern during home birth. Our home needed to have good directional lighting in whichever room(s) I planned to labour in so the midwives could carry out their examinations. It also needed a hard, flat surface in case the baby needed to be resuscitated and stretcher access in case of emergencies. Women wanting to use a birthing pool (I didn't) also have to check that their property is structurally sound enough to support its weight. She (awkwardly!) reminded me to have refreshments on hand for the midwives; they are on call for 24 hours and carry out their usual clinics and home visits during that time so, depending on the time of day and length of labour, they may have been on their feet for a very long time! I assured her that stocking up on snacks was already on the to do list; Steve can always be relied on to over-cater. She reminded me that some of the midwives live and work locally, but others would have an hour's drive to reach us, so to call the hospital fairly early on in labour - a plan of action could then be made over the phone. It would be pot luck which two midwives were on call on the day - there was a good chance it would be people I'd never met. We went through the birth plan section of my maternity notes, talking about who I hoped to have as my birth partner (Steve), what I wanted done about/with the placenta (injection and disposal) and whether I wanted the baby to have the vitamin K injection (yes). I didn't have any additional requests. We went over the possible complications and the reasons the baby and I could be transferred to hospital again. She also explained that the midwives prefer to do an internal examination every 4-6 hours and to listen to the baby's heartbeat roughly every 15 minutes in the early stages and after each contraction near the end. We confirmed that the midwives would go on call from 37 weeks. I stated that I was unlikely to accept a sweep, but that I was likely to accept induction at the latest possible date (40+12), purely because getting MM and me to and from the hospital for monitoring every other day beyond that is impractical. Under those circumstances, I would be offered an additional scan at around 40+7 to check fluid levels and the baby's growth. She asked whether I would be happy to (theoretically) have a student midwife present, which I would. A couple of days before my on call period began, a very friendly hospital porter arrived at our flat with two big boxes of kit, one funny looking stool and five canisters of gas and air. He told me they recommend leaving the gas and air downstairs; he carried the buggy which usually sits at the bottom of our stairs plus the two boxes and the stool up to the flat and was happy to put things wherever I asked him to. He confirmed that the fire brigade had been made aware we had gas and air on the premises (it's explosive!). On the pharmacy's last working day before my on call period, a community midwife dropped round a small box of drugs to be kept in our fridge. And then I spent all day Saturday hoping not to go into labour - I would have been seriously gutted to miss out on a home birth by a matter of hours! At 8am on the Sunday morning, my on call period began. Has anybody else had a home birth? Tell me all about it!